PORTER MAGAZINE, a new print publication produced by Net-a-Porter, the online luxury retailer, mostly covers fashion, but also devotes a fair amount of editorial to art and culture. 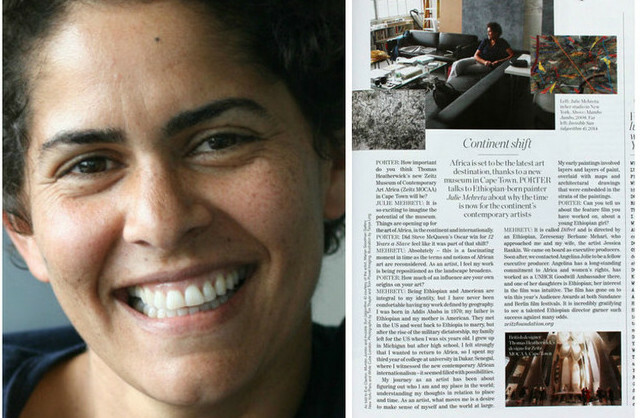 Its summer edition features a brief interview with Julie Mehretu (above, right-hand page) about Africa’s emerging presence in the contemporary art world. The Ethiopian-born, Michigan-reared, New York-based painter is queried about three issues: the significance of the new Zeitz Museum of Contemporary Art Africa, which is scheduled to open in Cape Town in 2016; whether her heritage influences her work; and the Ethiopian film she is producing. She confides that being Ethiopian and American are central to her identity, but she is not comfortable having her nationality or geography define her work. “My journey as an artist has been about figuring out who I am and my place in the world; understanding my thoughts in relation to place and time. As an artist, what moves me is a desire to make sense of myself and the world at large,” Mehretu tells Porter.